This book is filled with great historical gardening information, taken from Jefferson’s personal gardening records and notes. Everything from what he planted, why he planted it, how he planted it and when he planted it. Through all of this you begin to see all his successes as well as all his failures, but even with his failures he kept trying new things. The final section of the book walks you through the details of each vegetable that Jefferson grew in his garden. If you are into growing heirloom vegetables you will love reading this section, it will give you a little insight into the history of some heirloom vegetables. If you have never been to Monticello, after reading this book you will want to plan a trip. If you have already been there, you will want to plan a return trip. If you are thinking of planning a trip to Monticello this fall you may want to schedule it around the annual Heritage Harvest Festival. This festival is organized by Southern Exposure Seed Exchange, click here to learn more about the Heritage Harvest Festival. 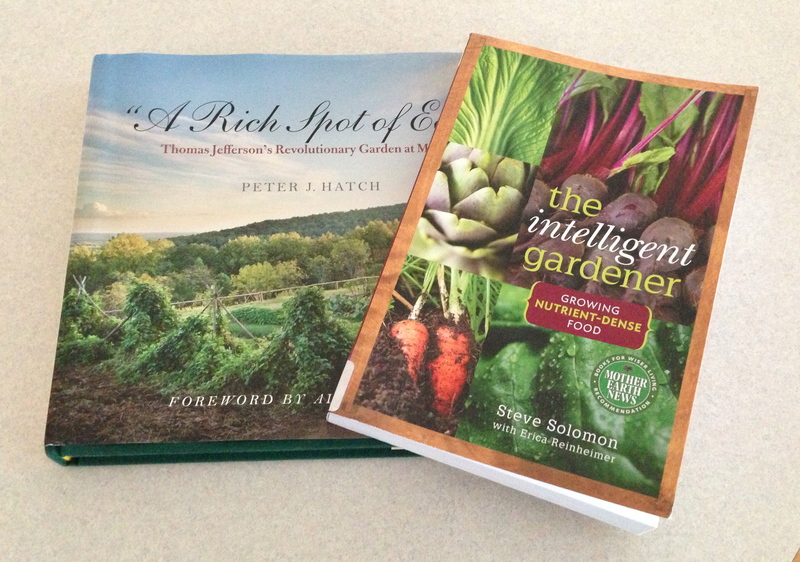 The second book is The Intelligent Gardener, Growing Nutrient-Dense Food by Steve Solomon with Erica Reinheimer. This book will make you rethink how you treat your garden soil. If you enjoy Steve Solomon’s Growing Food When it Counts, Growing Food in Hard Times, then this is a must read for you. Steve and Erica do a great job taking a complex subject like soil chemistry and simplify it so that it is easier to understand. Anyone interested in learning how to improve the quality of their soil, should read this book. They walk you through all the steps required to analyze your soil and how to develop a plan to correct any problems. This book is filled with lots of good information, charts, and worksheets to help you develop a solution to your soil problems. Has anyone else read any of these books, if so what do you think? This entry was posted in General and tagged Backyard gardening, gardening, Homesteading, Organic gardening, Urban Gardening, Vegetable Garden by M Riland. Bookmark the permalink. excellent! I love a good, educational read!